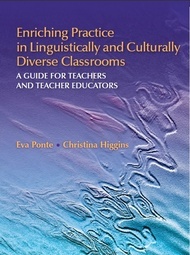 Eva Ponte is an associate professor in the College of Education at the University of Hawai‘i–Mānoa. Her work focuses on integrating teacher education programs with apprenticeship models of teaching and learning using assessment, feedback, and evaluation within a social justice framework. Her research, developed in local public schools, targets minority and bilingual students and families and promotes equity and diversity in education. She is the principal investigator of the Malihini and the Activating Educators Focus on Family Engagement as Central to Teaching (AFFECT) projects. Christina Higgins is a professor in the Department of Second Language Studies and co-director of the Charlene Junko Sato Center for Pidgin, Creole, and Dialect Studies at the University of Hawai‘i–Mānoa. Her research examines multilingual practices in schools and society from discourse analytic, ethnographic, and qualitative perspectives. She is the author of English as a Local Language: Post-Colonial Identities and Multilingual Practices, co-editor (with Bonny Norton) of Language and HIV/AIDS, and editor of Identity Formation in Globalizing Contexts: Language Learning in the New Millennium.